Like most non-Americans, Steve Martin first came to my attention as a comedic actor turning in some brilliant performances in films like Train, Planes and Automobiles (1987) and L. A. Story (1991). He had started his career as a stand-up comic but quickly moved into film. 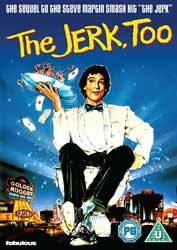 One of his earliest success was The Jerk (1979) which Martin starred and co-wrote. The film was a critical and financial success. The material was innocuous enough for someone to consider adapting it into a made for television film. The Jerk, Too (1984. 1 hr, 31 min, 46 sec) is a comedy film directed by Michael Schultz and produced by Martin. The story follows a similar trajectory to the original film. Mark Blankfield plays Navin Johnson, an intellectually challenged young man who has been raise by a black family in the deep south. On his eighteenth birthday he decides to take a trip to Los Angeles to attend his pen pals wedding. What follows are his adventures as he crossed the continent. I can only presume that Martin needed cash to have put his name to something which takes a clever idea and fails on almost every level. The biggest criticism of the film is not Blankfield’s charmless portrayal, it's that the film is just not funny. Martin’s portrayal was one of innocence and naiveté with the comedy coming from others lack of knowledge of this which leads them into supposing he is something other than he appears, not unlike the role of Chance which Peter Sellers played in Being There (1979). But whereas the two films provided gentle comedy based on social misunderstandings The Jerk, Too plays Navin as an unsympathetic moron. There is nothing here to like or admire. The film reeks of adequacy, poorly made, it has little to commend it.